On 6 April 1941, a world war left its mark on Milutin Milanković’s life and climate research for a second time. Nazi bombs destroyed the print works where his new book, summarising 30 years’ work, sat half-complete. As German-led forces occupied Serbia a month later, Milutin still had just one finished copy of his “Canon of Insolation and the Ice-Age Problem”. In it, he brought together his general astronomical theory of climate, which would explain how Earth’s motion in space drives ice sheet advance and retreat over tens of thousands of years. And when two German officers came to visit the University of Belgrade maths professor, he might have feared no-one else would ever see all his ideas in a single volume. But the officers were geology students, bringing greetings from Wolfgang Soergel at the University of Freiburg, who had previously published studies supporting Milutin’s calculations. Amid the drama unfolding around them, Milutin gave them his only copy to send to Freiburg for safe-keeping. But both Milutin and his work escaped to ultimately make strides forward in understanding what controls Earth’s temperatures. 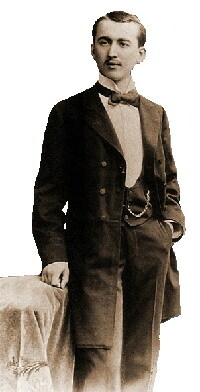 Milutin fixed his focus on climate after joining the University of Belgrade in 1909, while reading a paper about the Sun’s heat on the Earth’s surface, whose starting equation was wrong. To study how climate could produce dramatic changes like ice ages courted controversy even then because it was unclear the puzzle could ever be solved. So little was known that when Svante Arrhenius correctly identified CO2 in the air as an important factor his findings were ruled out by flawed experiments. Using heat from the Sun, the incoming solar radiation also known as insolation, Milutin looked at climate both on the Earth and other planets in our solar system. “A connection should be found between planets’ insolation and their atmosphere and surface temperatures,” he wrote. And thanks to the many different complex sciences such an astronomical climate theory combined, Milutin was the only one trying to make that link. By the time he went on honeymoon in 1914 to his home village of Dalj, today in Croatia, Milutin had written seven papers establishing climatology as an exact mathematical science. But the First World War intruded on the promise of a happy married life and academic career ahead. Serbia, where Milutin worked, and Austria-Hungary, the country that Dalj was in at the time, were on opposite sides of the war. As a Serbian citizen, he was arrested and sent to a prison camp. Milutin continued his painstaking handwritten calculations, and soon friends helped get him permission to go and live in Budapest, reporting to the police once a week. There he worked in the library of the Hungarian Academy of Science, writing several papers and a book on insolation, laying the mathematical basis for a theory that could model past and future climates. On his return to Belgrade Wladimir Köppen, a leading climatologist and head of the Naval Meteorological Observatory in Hamburg, Germany, and his son-in-law Alfred Wegener encouraged Milutin to push his calculations further back in time. In just a few years, he travelled deeper into the past: from 130,000 years at first, to 600,000, and then 1 million years. To do this, Milutin had to untangle gravitational pulls on Earth from the Moon, Sun, Jupiter, and Saturn. He broke the Earth’s orbit down to three cycles that work together to influence insolation. In the simplest, its movement around the Sun changes between being more circular and more oval over roughly 96,000 years. 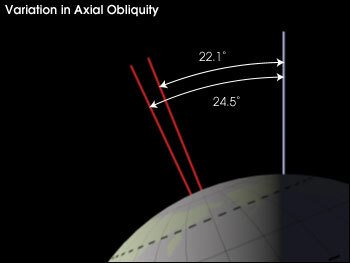 Another cycle affects the axis between the Earth’s North and South Poles, which is tilted relative to the Sun’s axis, currently at an angle of 23.5°. 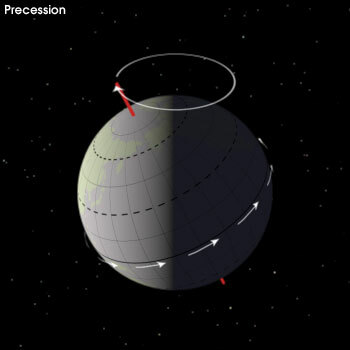 This is what causes the seasons, as the hemisphere nearest the sun is in summer, while the opposite one is in winter. That tilt changes from 21.5° to 24.5° and back again over about 41,000 years. And finally the Earth wobbles around this tilted axis, like a spinning top just before it stops, every 23,000 years. During these movements, now known as ‘Milankovitch cycles’, the Sun’s heat at the top of the planet increases and decreases by up to a fifth. By 1938 Milutin had calculated that the Earth’s ice cover depended on such changes in insolation, then began two years drawing together all his ideas into a single book – the ‘Canon’. Among his calculations, tables and formulas, which are still used today, he also showed how his cycles could explain how giant ice sheets grew and shrunk over 11 ice ages on Earth. Despite Milutin’s initial fears, the book sections that survived the bombing were soon put together with its remaining missing parts, with the Canon completed in Autumn 1941. While greeted with excitement, the Canon’s cycles didn’t match when most people then thought ice ages had happened. Many also thought tiny changes in orbit couldn’t have such important effects and so, like Svante Arrhenius before him, Milutin’s findings were not accepted at first. Disagreements came because ice ages are difficult to date, partly because each one erases much of the evidence of those that came before. But the right timing came out in the decades to follow, from unlikely sources. In the 1950s Cesare Emilani at the University of Chicago found it in slimy cylinders of soot and clay drilled from sea and lake beds. 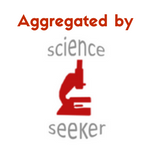 In the 1960s Wallace Broecker at the Lamont Geological Observatory in New York found it in ancient coral. Their records both showed regular variations, matching the Milankovitch cycles. Now accepted, the Milankovitch cycles made the seemingly worrying prediction that today’s Earth should be headed into another ice age. Some concerns over this even made the mainstream media in the 1960s and 1970s. But even then it was becoming clear that we’ve strayed from that path, and just this week another paper has again confirmed the long-term cooling pattern that has been reversed in the past century. And as scientists succeeding Milutin have shown, that’s because human actions have thrown a spanner into the celestial climate clockwork he discovered. Spencer Weart’s book, ‘The Discovery of Global Warming’ is the source of inspiration for and some historical material in this post. The University of Belgrade library has a useful virtual exhibition covering Milutin’s life.